It’s a folk art family tree of tintypes! (At least we believe they are tintypes; without prying the frames off, we can’t fully inspect them to say for sure.) 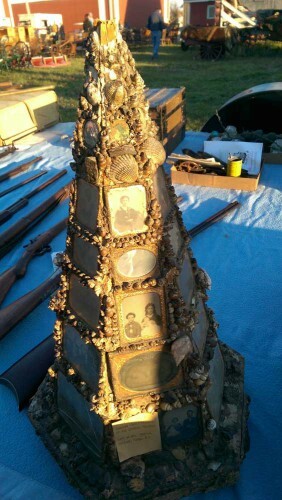 The “tree” is made from a six-sided wooden base pyramid, covered with plaster used to hold the shells, photos in frames, mirror etc. in place. There once was a ring of old tokens at the top as well, though those were apparently removed awhile ago (you can still see the impressions of them in the plaster). The bottom has four metal caster wheels. Measures 27 inches tall; 18 inches along the widest part of the base. I’m amazed by it. It’s not like Godey’s Lady’s Book had their own Martha Stewart columnist suggesting a “how to” for such things. (If they did, I would think these folk art family trees would have become as popular as the Christmas tree the magazine made de rigueur.) At the time this was likely made, circa 1880s (1910s at the latest), North Dakota may not even have been a state yet, and Fargo may have only had a population of less than 6,000! As promised on our Facebook page, I’ve posted more detailed images of this true piece of Americana. Among the notable antique photographs shown below: A gentleman who appears to be in a Civil War uniform, with a colorized stars and stripes flag, and a woman who looks to be Native American. This is what it looks like in our little “nook” space at Exit 55 Antiques (Fergus Falls, MN) with the antique French candelabra. We also have it listed for sale in our Etsy shop. I believe the photos here and in the listing should answer all your questions, but feel free to contact us if you’d like. 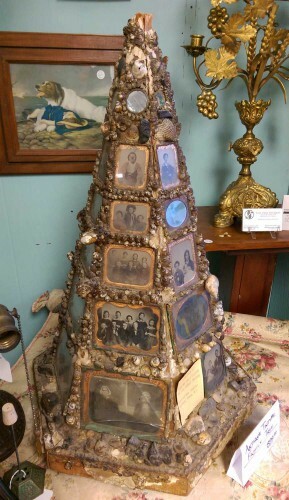 5 Responses to "A Rare Antique Folk Art Find: A Family Tree Made Of Tintypes"